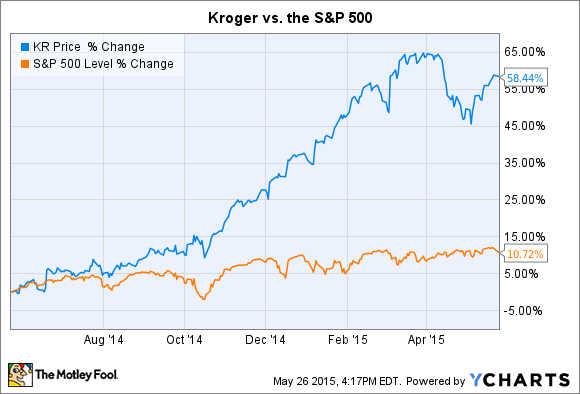 Is It Time to Take Profit on Kroger Co Stock? With shares up 62% in a year, the grocer is more expensive. But that doesn't mean you should sell here. Kroger's (NYSE:KR) shareholders have had plenty of reason to be enthusiastic over the last several years. Shares are up 270% since 2010 -- three times the market's return. And Kroger's 60% gain in the last year makes it the 10th best performer in the entire S&P 500 over that period. You can't blame investors for feeling optimistic. After all, the grocery store chain is pushing an awesome win streak: 2014 marked its tenth straight year of rising market share and falling costs. Those happy trends pushed earnings up by 24% last year after rising 13% in 2013. However, there are serious risks to owning this retailer right now. Competition is the biggest one, as rivals including Wal-Mart (NYSE:WMT), Whole Foods (NASDAQ:WFM), and Costco (NASDAQ:COST) are each fighting for a bigger slice of the growing food market. And since Kroger's stock valuation has climbed from 18 times earnings a year ago to 22 times now, there isn't much room for slipping business results. But I believe Kroger will keep outperforming from here. The grocer is likely to stretch its streak of industry-leading sales and profit growth, which should help the stock stay a strong investment. One big reason is Kroger's massive pricing advantage. The important number to remember here is $3.5 billion. That's the total spending that Kroger allocated to price cuts in just the last year. By comparison, Costco cleared $3.2 billion in total operating income in 2014. Price leadership is a key reason why Kroger improved comparable-store sales by 5% while rivals like Wal-Mart and Target (NYSE:TGT) barely managed 1% growth. But the best news for shareholders is that those price cuts came even as Kroger booked a 25% profit improvement. The company showed that it can steal market share while also boosting profitability. Whole Foods, Wal-Mart, and other rival retailers have more worries ahead because Kroger expects to keep the competitive pricing pressure up this year. Management plans to fund extra price investments through lowering expenses and by using its company-owned manufacturing plants to squeeze costs even lower. Meanwhile, Kroger is attracting new customers through a growing in-store brand strategy. Its corporate brands hit a seven-year-high 28% of total sales volume last year. Franchises like Big K and Private Selection helped, but the real standout was Simple Truth, Kroger's organic and natural foods brand. Since launching in 2013 that franchise has grown to include 2,700 products within Kroger's grocery aisles. And Simple Truth has already passed $1 billion of annual sales, making it the company's most successful new brand launch yet. "Even though natural and organic foods have been notoriously out of reach for many customers, we used our merchandising expertise, manufacturing base and buying power to make them affordable and accessible to all customers." Organic and natural sales are growing at a double-digit pace, compared to 3% for the broader grocery industry. With Simple Truth, Kroger is positioned to grab more than its fair share of that fast-growing sector. Wall Street analysts expect Kroger to book a slight sales uptick of only 1% when it announces first-quarter earnings results in mid June. But that soft result will have more to do with lower gas prices than weakness in Kroger's core retailing business. Management said in March that they see comps improving by as much as 4% for the full 2015 fiscal year. Profit should grow to about $3.85 per share, right in line with Kroger's goal of boosting annual earnings by between 8% and 11%. That also leaves the stock valued at less than 20 times this year's earnings, which isn't expensive when stacked up against Costco's 27 multiple and Whole Foods' 25.